Fleas and ticks are the most common external parasite (ectoparasite) of dogs and cats. Parasites can invade your pet any time of the year. 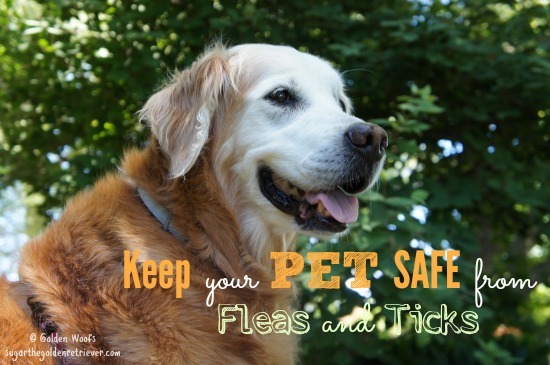 Be a responsible pet parent, protect your pet from fleas and ticks. It is important to protect your pet by implementing a year-round parasite control program. Fleas are wingless insects that have six legs and can jump. Fleas thrive in warm temperatures, high humidity and prolific in the summer months. Fleas can transmit tapeworm infection. Fleas are also known to give pets Allergy Dermatitis and skin irritation. Ticks are scary arachnids. Unlike fleas that jump off, ticks crawl up. Ticks attach themselves to the skin and feed on blood. The most common that affect a dog are Brown and American dog ticks. Ticks are hardier than fleas and tougher to kill because they can survive near freezing temperatures. Ticks are known to transmit deadly Lyme disease. 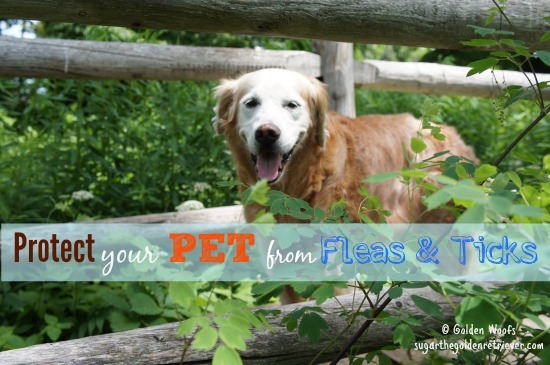 There are many ways to protect your pet against these pesky fleas and ticks. Vacuum frequently and dispose the bag immediately as fleas can live in rugs, carpets, cracked floors, beddings etc. There are numerous flea and tick products in the market. Be a smart pet parent. Select the product to best suit your pet’s need. Any concerns on product types and ingredients, consult/discuss with your veterinarian. 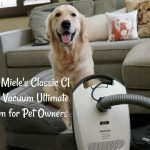 Looking for additional information, PetParents.com is a great resource. Older pets tend to be susceptible to many diseases. Extra protection is needed for safety since many senior pets become more sensitive to flea bites. Senior pets’ also have a weaker/aging immune system and drier skin. Many dog breeds like Golden Retrievers are allergic to flea bites. For the past 12 years, Sugar incurred several minor flea and ticks encounters. It was immediately caught and several precautions were taken. As Sugar continues to age, protecting her from pesky fleas and ticks is a priority. This year, I’ve elected to use a Seresto Flea and Tick collar. 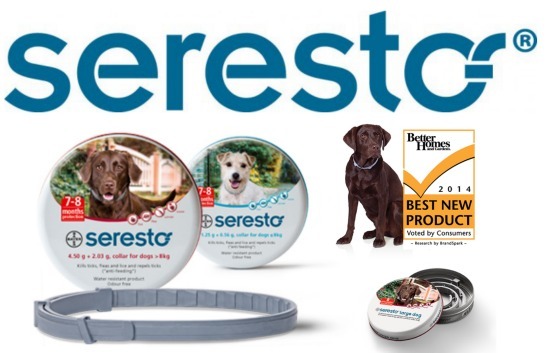 Seresto Flea and Tick Protection Collar for Dogs won the 2014 Better Homes and Gardens: Best New Product Award. Sugar is currently wearing a Seresto Collar, providing reliable 8 month flea and tick protection. There is no need to remember monthly applications as it continuously supplies active ingredients to ensure defense from pesky fleas and ticks. 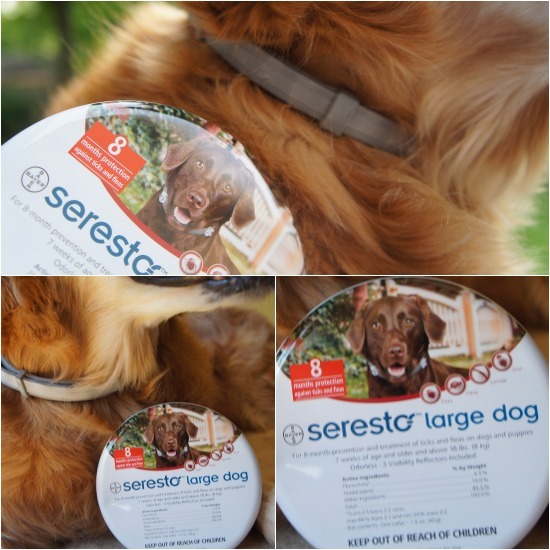 I will share more about it next month on our Seresto Collar Review post. What flea and tick protection do you use for your pet? 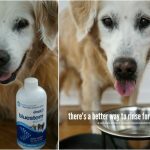 Disclaimer: This post is sponsored by Bayer/Seresto and the Pet Blogger Network. 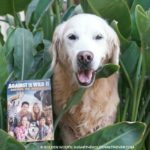 I am being compensated for helping spread the word about Seresto product but Golden Woofs only shares information we feel is relevant to our readers. Bayer/Seresto is not responsible for the content of this article. That will be great to see what your final review is….and don’t forget to mention what it smells like….nothing worse that stinky flea collars. Hmmm, I did not realize that fleas and ticks are worse for us as we age, Sugar. That is good information to share! I hope your Seresto collar works well for you. I have mine on and I’m going to see if it helps keep fleas off so I do not get flea bite allergy. It sounds like a great product, and I just saw a promotion for it at our vet office… but I’m still not sold on a “flea collar” ……. hmmm. Great tips! Those flea collars sound interesting! can’t wait to read your review on them! I have always wondered about the collars because my thoughts are, how does it protect the whole dog when it is just around their neck? SO I look forward to your review and learning some more about them. We are interested in this product. We use Frontline, but would like to get away from it. Can’t wait to read your review of it as we trust your opinion. We are lucky to not have those troubles around these parts. It’s a benefit of the dryness! Nasty little buggers! We’re curious to see how well the collar works. We recently got some Only Natural Pet herbal defense shampoo, conditioner, and spray that we are also going to use and see if that helps. Our foster dog came with ticks, and now while she doesn’t have them anymore, I did find a tiny one on Kronos’s ear after that. So we are implementing some parasitic preventative methods! Luckily no ticks here and we keep away from the deer parks for that reason. Fleas not here too as I have my frontline regular as clockwork. Have a fabulous Friday Sugar. We are trying to go the all natural route, and I’m not sure this would fit into that. We’re still having trouble with ticks though, so I will be interested in reading your review and learning more. We’re lucky. We live in an area where fleas are RARE and no ticks. BUT when SHE lived near the coast, it was a constant problem. Anything that makes is easier for dogs and humans is fantastic. That was lots of good info Sugar. Those fleas are evil little boogers! We’re inside cats so we don’t get fleas…but the mom always worries that some might come in to the house. We sure hope not. Fleas are nasty. We don’t have a problem with fleas or ticks, but I am using wipes on both the boys right now. I hope the collar works great for Sugar. Fortunately, I live in an area where fleas are uncommon. My vet said with REVOLUTION my Golden is protected for heartworms, fleas and ticks. No use to have anything else. Can the collar be used along with advantix2 for a 6 pound dog? We have a terrible tick problem in NJ and the advantix is not working. Please help. PS no fleas . Fleas are the worst! There is a lot of wildlife and woods here, and fleas and ticks can be a real problem. 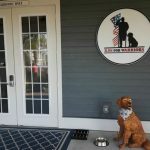 We protect our dogs and cat in spring/summer/fall with a topical application once a month. We also give the dogs a heartworm preventative “treat” monthly.